The department, (Border Security Force) has released the Official Notification regarding the BSF Head Constable Recruitment 2019. BSF Recruitment 2019 is a great platform for all the candidates who are interested to be the part of the defense field. BSF Recruitment 2018-19 has released for the Head Constable (RO/ RM) profiles. The Official Notification is available on the BSF Official Website i.e. wwwbsf.nic.in. 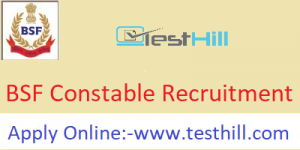 Candidates can go there and check all the essential information regarding the BSF Constable Recruitment 2019. All aspirants are advised to check the official website to check whether they are eligible or not. There are a total of 1072 posts for the declared recruitment. Starting date of BSF Recruitment 2019 Online Apply is 14th May 2019. All candidates are advised to apply for BSF Recruitment 2019 before the last date i.e. 12th June 2019. The authority will not accept any application after the due date. So, the BSF Online Applications have opened from 2 February 2019. Interested candidates can apply in the BSF Constable Recruitment 2019 between 2 February 2019 to 03 March 2019. They all should apply before the last date, as the authority will not accept any application after the due date. The authority has all rights to reject or trash any application at any time between the whole process. So, all candidates are suggested to provide authentic personal information while making the BSF Constable Online Application 2019. They all have to check all the required criteria such as age, educational qualification etc. All information regarding the payment mode is available on the BSF Official Website. One can choose any suitable mode for payment.